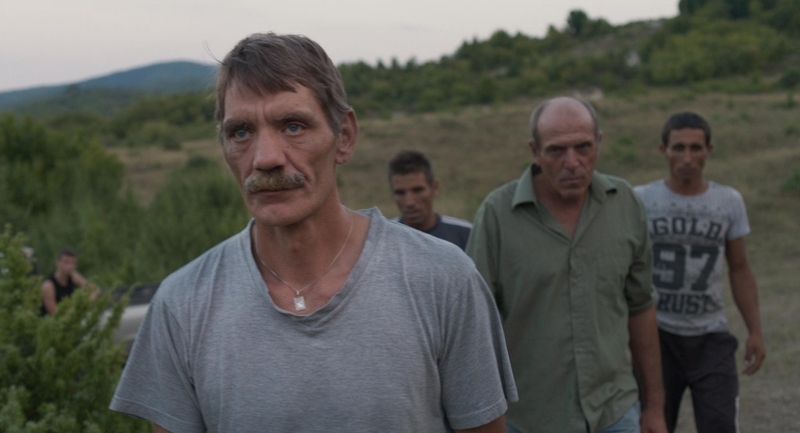 Armed with an Arri Alexa and a cast of non-actors, Valeska Grisebach crafts Western as exactly the kind of film you’d expect to see in the Un Certain Regard sidebar of Cannes. Naturalistic, unaffected acting? Check. Handheld camera? Check. Socially-relevant/political plot and thematic content? Check. The socially-relevant plot here follows a group of German men travelling to a village in Bulgaria, tasked with building a new hydro-plant. The men make no attempt to integrate into their new residence. One actually raises the German flag atop their construction site, heedless to how a Bulgarian, especially one with a sense of European history, might read such an act. The men may still be in the EU, but they clearly don’t think of this backwater as worthy of courtesy. Especially not during their free time, which consists largely of sitting by a river, drinking copious amounts of beer, and braying. One day, two women from the village pop by to swim, and the construction foreman steals one of their hats, lording it over the woman like an elementary school bully. None of this amuses the locals. But Meinhard is different. He feels no attachment to his brethren from the Western (!) part of the continent, finding himself connecting better with the villagers. After awkward introductions, he soon finds himself a regular at card games, a guest at dinners, and embroiled in a burgeoning romance with a local. Everyone, for the most part, seems so pleasant. Acting as the bridge between the migrants and the villagers, Meinhard comes to feel as though Bulgaria might be a good place for him to set up camp, somewhere to belong in a way it seems he never did in Germany. Hospitality is not acceptance, however. Blinded by this need for inclusion, he soon learns that European social consciousness in the 21st century cannot easily erase millions of years’ worth of evolutionary tribalism. Though Grisebach uses her Cannes-friendly toolkit to imbue her work with a sense of verisimilitude, it mostly functions to keep the audience at a slight remove. The problem isn’t the style as such, as what it’s in service to: a screenplay that feels a bit more like a thesis than a slice-of- life. (Even the title feels designed to invite wanton over-interpretation.) Each scene seems cannily fashioned to convey some theme—be it about masculinity, colonialism, power structures, or affiliations both national and familial. But they’re all pitched at about the same level; strung together, the film’s overarching structure feels a bit flat. Other exemplars of this style—Andrea Arnold, compatriot Maren Ade, Cristians Mungiu and Puiu— manage to keep viewers somewhat oriented as to their position in the narrative. In their films you can intuit, for example, that you’re somewhere in Act Two, or that since the narrative threads are tying together, you’re close to the end. Its construction negates this intuitive orientation, so Western feels a bit longer than its runtime. It also seems a bit like an outlander’s view of masculinity, but that’s not really a debit. This actually allows for the film’s biggest virtue: a gradual, palpable, rising feeling of helplessness. As a foreigner to Bulgaria, Meinhard’s perception of its residents’ secret codes and hidden motivations gains a sinister pallor, and he slowly comes to feel like an organ the village’s body rejects. Similarly, as an outsider to her protagonists, Grisebach’s men have a threateningly alien quality, though on the surface they seem fairly normal. Hewing to a more dynamic narrative structure may have dampened this effect, though it’s a trade-off I’d be willing to make. For all its faults, Western may serve as a bit of a palliative to our current cinematic climate. I’ll admit, I’m tiring of mundane fistfights between interchangeable superheroes and monsters. It’s not a small pleasure to find a director willing to explore something deeper, like the brute physicality manifested from the vagaries of the simian brain. Even if her film generally kept me at an emotional distance, Valeska Grisebach is clearly a deep thinker—a virtue too often brushed aside in the search for spectacle. Western may not be her masterpiece, but you can see one in her future. Out in the UK on the 13th of April.